Suspects were handcuffed after police said one of them rammed an officer's vehicle while trying to flee in a stolen pickup. A Honolulu police officer stopped the truck with a shot to a rear tire. A 20-year veteran Honolulu police sergeant ended a car chase in Haleiwa yesterday by shooting out a tire of a stolen pickup after the driver allegedly crashed into the officer's car. The 44-year-old sergeant drove past Matsumoto Shave Ice store at 66 Kamehameha Highway about 9:30 a.m. and saw three people in a silver pickup truck, police said. He checked the license plate and discovered the vehicle had been reported stolen from Kalihi. The officer turned his vehicle around, according to police, but the suspects had left in the truck. The sergeant called for the police helicopter for help finding the truck. 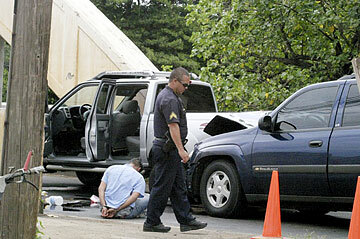 The suspects were seen heading toward Kahuku and approaching the Anahulu Bridge. The sergeant found the suspects and followed them onto the bridge in his subsidized sport utility vehicle. A patrol unit on the other side of the bridge blocked the Kahuku end, and the driver of the truck put it in reverse in an attempt to escape, according to police. The driver allegedly crashed the truck into the front of the sergeant's vehicle. Both the sergeant and the patrol officer approached the truck from opposite directions, but police said the driver continued to rev the engine and tried driving back and forth. The sergeant fired one round into the left rear tire of the vehicle to stop it, police said. The three suspects in the truck, two men, ages 20 and 21, and a 19-year-old woman, were arrested for investigation of auto theft and first-degree attempted murder. Police said the sergeant involved in the shooting has been placed on paid administrative leave, which is standard procedure whenever an officer fires a weapon. Police Capt. Frank Fujii declined comment until the internal investigation is completed.